The Asian Studies program is pleased to recognize two awardees this year. 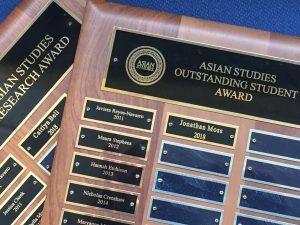 Jonathan Moss, a History major and Asian Studies minor from Athens, Alabama, received the 2018 Asian Studies Outstanding Student Award, which is given in recognition of his outstanding work and contributions to the academic study of Asia at UA. Caitlyn Bell, a Religious Studies and Anthropology double major from Fort Payne, Alabama, received the 2018 Asian Studies Research Award for her thesis “Exhibiting Asia: When Asia Meets America in Contemporary Museums.” She has also been selected to present this research at multiple events, including the regional meeting of the American Academy of Religion. Congratulations to both of our awardees!